May 30, 2016 – NASA measured rainfall at an inch per hour as Tropical Depression Bonnie continued to linger along the South Carolina coast. On May 30, Bonnie continued moving along the coastline near Charleston, South Carolina and additional heavy rainfall expected over the Carolinas. There are no coastal watches or warnings in effect. The Global Precipitation Measurement mission or GPM satellite that co-managed between NASA and the Japan Aerospace Exploration Agency had an excellent view of Tropical Depression Bonnie as it flew over the southeastern United States on May 29, 2016 at 2326 UTC (7:26 p.m. EDT). Rainfall was analyzed using data collected by GPM’s Microwave Imager (GMI) and and Dual-Frequency Precipitation Radar (DPR) instruments. 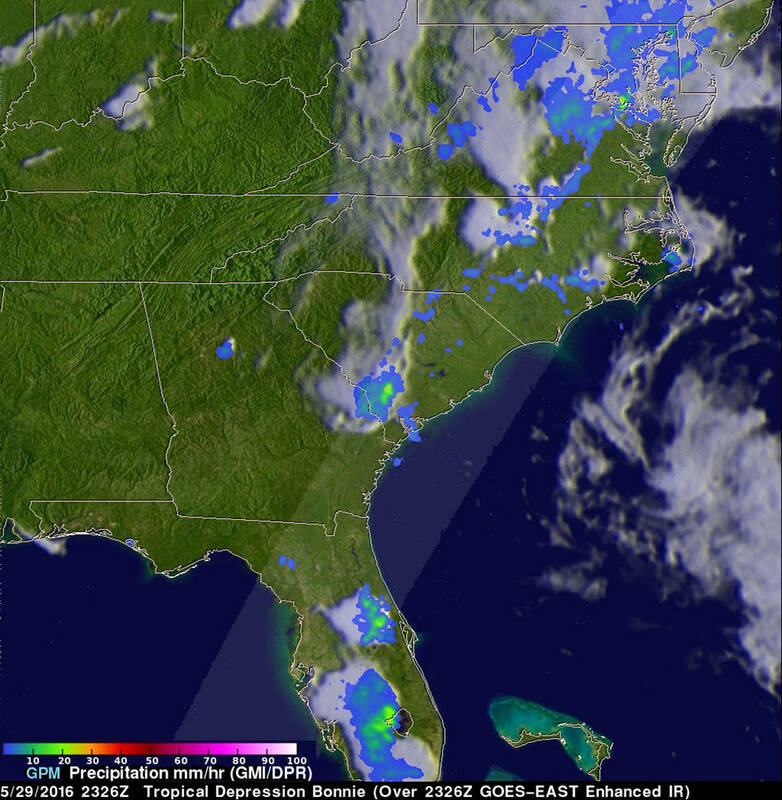 GPM’s radar (DPR) showed rain falling at a rate of over 25.4 mm (1 inch) per hour in South Carolina. GPM’s Radar (DPR Ku Band) was able to see through cloud cover in the tropical depression and show the vertical shape of rain within storms. GPM’s DPR calculated the heights of storm tops, showing where the highest, strongest thunderstorms were within Bonnie. At 5 a.m. EDT (0900 UTC), the center of Tropical Depression Bonnie was located by NOAA Doppler radar and surface observations near latitude 33.0 North, longitude 79.5 West. The depression is moving toward the northeast near 3 mph (6 kph). The National Hurricane Center forecast calls for a slow northeastward or east-northeastward motion for the next couple of days. On the forecast track, the center of Bonnie is expected to move near or along the South Carolina coast today and the North Carolina coast on Tuesday and Wednesday. Maximum sustained winds are near 30 mph (45 kph) with higher gusts. Little change in strength is forecast during the next 48 hours. The estimated minimum central pressure based on nearby surface observations is 1011 millibars. The National Hurricane Center (NHC) expect Bonnie to produce additional rainfall accumulations of 1 to 2 inches across east-central Georgia, central and eastern South Carolina, and eastern North Carolina with isolated maximum amounts near 4 inches. Farther north, the moisture from Bonnie will produce additional rainfall amounts of up to 2 inches across eastern portions of the mid-Atlantic region into southern New England through Wednesday. Bonnie is expected to produce dangerous surf and rip current conditions along portions of the southeastern United States coast through Monday. Total rainfall of more than 8 inches has already occurred over large portions of south-central South Carolina. The National Hurricane Center predicts that Bonnie will move very slowly along the Atlantic coast over the next few days. GPM is a joint mission between NASA and the Japan Aerospace Exploration Agency (JAXA). The GPM Core Satellite Microwave Imager (GMI) was built by Ball Aerospace & Technologies, Corp. of Boulder, Colorado. GMI has performed flawlessly in its first year on orbit as the most accurately calibrated radiometer in the twelve-satellite GPM constellation. GMI is one example of Ball’s long support of the country’s weather observation and climate science. The GPM constellation also includes the Ball Aerospace-built Suomi National Polar-orbiting Partnership (NPP) satellite, which launched in 2011, and will include the first Joint Polar Satellite System, currently in development at Ball meeting cost and schedule requirements. Both satellites enable faster, more accurate weather forecasting.